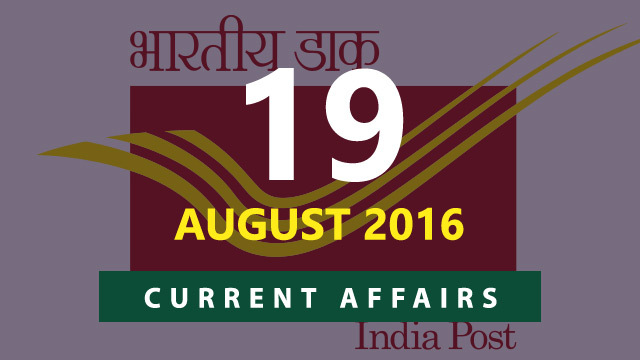 Hi Aspirants, here is the Current Affairs Quiz for 19 August 2016 useful for SSC, UPSC, IBPS, Bank Exams and other PSC Exams. 1. Badminton player P V Sindhu on 18 August 2016 won historic silver medal in women’s singles badminton event at Rio Olympics 2016. Which player defeated P V Sindhu in the final? Note: Sindhu became the first Indian woman to clinch a silver medal in Olympics. She also became the fourth Indian to win a silver at the Olympics after shooters Rajyavardhan Singh Rathore (2004, Athens) and Vijay Kumar (2012, London) and wrestler Sushil Kumar (2012, London). 2. World Humanitarian Day was observed on? Note: The digital campaign for the World Humanitarian Day 2016 was The World You’d Rather. 3. Which city was recently named as world’s most liveable city for the sixth year running according the Economist’s global liveability survey? 4. Who was recently awarded the prestigious 25th Vyas Samman 2015 for her poetry collection “Kshama”? Note: The award instituted by the K K Birla Foundation carries a cash prize of Rs 2.50 lakh. 5. India Post Payments Bank Limited (IPPBL) has received the Certificate of Incorporation from the Registrar of Companies, Ministry of Corporate Affairs under the Companies Act 2013. Earlier Union Government has given its approval for setting up IPPB as a Public Limited Company under the DoP with ___% Government of India (GOI) equity? 6. State Bank of India’s (SBI’s) board of directors on 19th August 2016 has approved merger of its five associate banks and which other bank with itself? Note: These five subsidiaries are State Bank of Bikaner & Jaipur, State Bank of Hyderabad, State Bank of Mysore, State Bank of Travancore. 7. Which state Government recently became first state in the country to launch India’s first comprehensive ‘Crime Criminal Tracking Network System’ (CCTNS)? 8. Who was conferred with Sangeet Martand Ustad Chand Khan Lifetime Achievement Award recently? 9. Court of Arbitration for Sport (CAS), situated in Lausanne, Switzerland, on 18 August 2016 banned which Indian wrestler for four years following an appeal by World Anti-Doping Agency (WADA)? 10. Who recently became the first Iranian woman to win an Olympic medal? Note: She won the bronze medal in Taekwondo. 11. Which bank has recently unveiled a payment service dubbed as "iMobile SmartKeys" that uses smartphone keyboard to make quick & secure payments? 12. Federal Bank has announced its partnership with ___, a mobile banking application, to provide cashless transactions? 13. Which Indian former player was recently awarded the honorary life membership of the Marylebone Cricket Club? 14. Who won the Gold medal in men’s 200m at Rio Olympics 2016? Note: He ran 19.78 seconds to come home ahead of Canada’s Andre de Grasse and France’s Christophe Lemaitre. 15. Govind Tej who died on 19 August 2016 was a noted filmmaker,actor & director in which language? 16. The world's longest and highest glass bottom bridge is set to open soon in which country?